A regulation is “procyclical” if it exacerbates business cycle fluctuations. For example, imagine if citizens of a country had to pay more taxes when their incomes are lower. This would force households to cut their spending even more in a recession and would make tax regulation procyclical. In the realm of bank capital regulation, a procyclical regulation would increase capital requirements exactly at a time when banks’ capital base is already under some pressure due to an increase in losses during a recession. Capital constrained banks would then be forced to deleverage by reducing their lending capacity, exacerbating the economic downturn. The new current expected credit loss accounting standard (CECL), which will replace the existing incurred-loss approach for setting loan loss provisions, is a perfect example of a well-intentioned regulation that will make capital regulation more procyclical. For other important CECL issues see a previous TCH blog post. This blogpost summarizes some key results of a working paper just published by BPI that analyzes the performance of CECL had it been in place during the 2007-2009 financial crisis. The paper finds that CECL would have been highly procyclical, amplifying the contraction in bank lending and the severity of the past crisis. CECL would have been procyclical because macroeconomic models (and macroeconomic forecasters) are generally unable to accurately predict turning points in the business cycle. As a result, judging by real-time consensus forecasts, CECL reserves would not have increased significantly as banks approached the start of the financial crisis in early 2007. Once the crisis was upon us, loan loss reserves under CECL would have experienced a sudden and dramatic rise and peaked around the bankruptcy of Lehman Brothers. The rapid increase in allowances under the new accounting standard would have been especially impactful for portfolios with longer loan lives, such as first-lien residential mortgage loans. For example, for a $500 thousand mortgage loan our results indicate a bank would be booking a loss of $3 thousand in good times for originating that loan and nearly a $30 thousand loss in bad times for the same loan, almost a tenfold increase. In aggregate, banks’ regulatory capital ratios would have declined by an additional 1.6 percentage points, and would have likely resulted in a substantial contraction in lending. In June 2016, the Financial Accounting Standards Board (FASB) published “Accounting Standards Update No. 2016-13,” which dramatically changes how entities are required to account for credit losses on financial instruments. The standard changes the “probable incurred loss” approach for reserving to an expected loss approach. Under this new standard, when a bank makes a new loan, it needs to provision an amount equal to the losses the bank estimates it will experience over the entire life of the loan. The new standard was introduced because it is in theory, forward-looking: that is, banks will have pre-built reserves when an economic downturn hits, and therefore will not have to begin posting them only as losses become probable and estimable. Under CECL, banks will determine expected losses over two horizons. Over the period under which the bank can make a “reasonable and supportable” forecast, the bank projects the lifetime probability of default of a loan using its own models based on a forecast of the economy and loan characteristics. The “reasonable and supportable” period is likely to be between two to three years and will vary by bank. Next, beyond the “reasonable and supportable” period, the lifetime probabilities of default are assumed to revert to their historical average for each loan category for the remaining life of the loan. The lifetime expected credit loss of a loan, therefore, is equal to its lifetime “probability of default” times its “loss given default”. The loan loss allowance is expected to be higher under CECL than under the incurred loss standard because it reflects all loan losses that are expected over the life of the loan, not just the loan losses that are judged with probability to have already been incurred. (And CECL gives no credit for the expected, corresponding revenue earned over the life of the loan.) Other things being equal, because the allowance is a negative asset the higher allowance results in lower levels of capital. As shown in the next section, the requirement to increase reserves when forecasters are able to pick up a worsening in economic conditions is akin to an increase in capital requirements in a downturn. The main challenge under CECL is that banks need to forecast the state of the economy to determine loan loss reserves. It is notoriously difficult to forecast turning points in the business cycles, as illustrated by examining the forecast errors for the unemployment rate during the 2007-2009 financial crisis. Thus, any analysis of the new accounting standard that assumes perfect foresight will inevitably reach the wrong conclusions; unfortunately, belief that CECL will be countercyclical appears to be based on just such an analysis. Figure 1 shows the errors of the eight-quarter-ahead forecasts for the unemployment rate between 2004:Q4 and 2012:Q4. The chart depicts the forecast errors obtained using our own model (Baseline VAR model) as well as those obtained using the average responses from the Survey of Professional Forecasters (SPF). 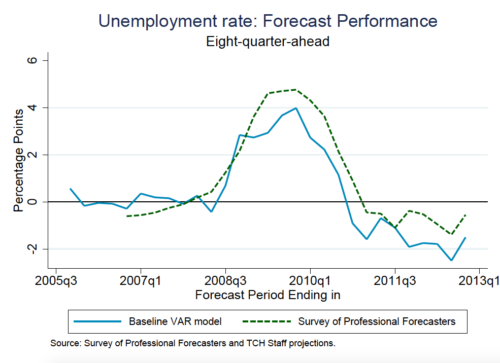 Positive values in the y-axis correspond to two-year forecasts underestimating the rise in the unemployment values; conversely, negative values indicate that two-year-ahead projections are overestimating the increase in the unemployment rate. Before the start of the recession in 2007:Q4, the forecast errors are generally small. For example, the forecast error for the projection ending in 2007:Q4 was -0.1 percentage points based on our model. In contrast, when the recession starts, both sets of forecasts significantly underestimate the rise of the unemployment rate. In particular, the forecast error for the projection ending in 2009:Q4 exceeds 3¾ percentage points based on our model, and 4 percentage points using the SPF data. Figure 2 plots the results for CECL reserves under the baseline macroeconomic scenario (see paper for more details). For comparison purposes, the chart also depicts reserves that were actually taken under the incurred loss methodology scaled by total loans (allowance for loan and lease losses, or ALLL). The chart shows two main results: (1) CECL reserves are not that different from ALLL when the economy is not in a recession; (2) when the macroeconomic forecasts start to pickup, the deterioration in economic conditions CECL is very procyclical, and would have likely exacerbated the 2007-2009 financial crisis. One can think of the rise in CECL reserves as a multiplier effect: under the incurred loss standard reserves only rise when losses tip to probable; under CECL, in contrast, reserves increase for every loan taking into account its entire expected life. Therefore, the impact on loan allowances due to a change in forecast is much higher under CECL. 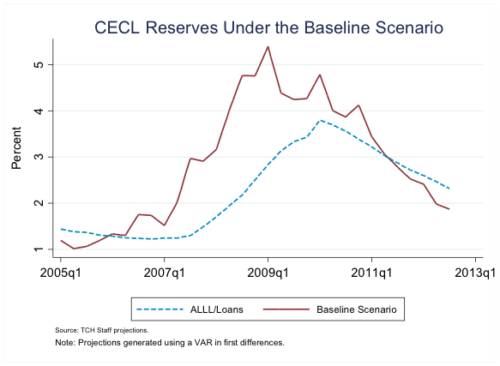 As shown in Figure 2 above, between the first quarter of 2005 (the first quarter in which CECL reserves are estimated) and the first quarter of 2007, the ratio of CECL reserves to loans trends slightly upwards. In particular, in the first quarter of 2007, reserves under CECL were just 50 basis points above reserves under the incurred-loss methodology. These results cast strong doubt on the premise that CECL reserves would have been countercyclical by forcing an early recognition of loan losses and incentivizing banks to tighten lending standards. The main reason why the path of CECL reserves is not so different from ALLL is because until the end of 2006, almost all forecasts were projecting the house price index to continue to rise or stay flat over the next 2 to 3 years and the unemployment rate to remain low. However, in early 2007, forecasts started to anticipate the coming deterioration and between the first quarter of 2007 and the third quarter of 2008, CECL reserves would have ramped-up rapidly from 1½ percent to 4¾ percent. In contrast, actual reserves that were taken under the incurred loss methodology rose approximately 1 percentage point between the first quarter of 2007 and the third quarter of 2008. This result illustrates CECL’s procyclicality: the new accounting standard would have forced banks to hold significantly more reserves over the life of the loan in a relatively short amount of time at the same time as a bank’s capital started to be eroded by loan losses. As noted earlier, the requirement to increase reserves is akin to an increase in capital requirements in a downturn. As a result, had CECL been in place during the 2007-2009 financial crisis, banks likely would have cut lending very aggressively in an attempt to partly offset the increase in capital requirements, as it would have been difficult or costly for banks to raise new equity during that period. The converse is also true: when economic conditions recover, reserves under CECL decline at a much rapid pace relative to the incurred loss methodology. As a result, by the third quarter of 2011 reserves under the new standard would be projected to be lower than those under the incurred loss methodology. 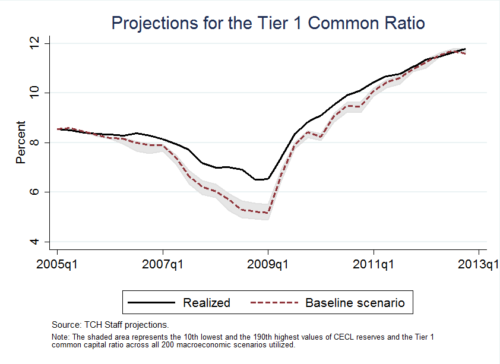 Figure 3 plots the observed Tier 1 common ratio (T1CR) for the entire U.S. banking industry and under CECL baseline forecasts. The difference in the T1CR under the incurred loss methodology and CECL is approximately 25 basis points in the first quarter of 2007. Therefore, the implementation of CECL in 2005 would not have induced banks to significantly increase loan loss allowances up to the period in which the economic outlook starts to deteriorate. The gap between the T1CR under the incurred loss methodology and CECL starts to widen in early 2007. In particular, the T1CR under CECL would have fallen from 7.9 percent to 5.3 percent between the first quarter of 2007 and the third quarter of 2008. In addition, the difference between the T1CR under the incurred loss methodology and CECL is 1.6 percentage points in the third quarter of 2008. The paper presents evidence that suggests that the impact of CECL on capital requirements would have caused bank lending to have dropped by an additional 9 percentage points during the last crisis. Our results indicate that CECL could increase significantly the procyclicality of lending and exacerbate economic downturns. Notably, while many post-crisis regulations focus only on large banks, accounting standards (rightly) apply in the same way to all companies; thus, the effects of CECL will be felt across the entire banking industry, making the stakes quite high. It may be helpful for the agencies to conduct a quantitative impact study to assess the impact of CECL on bank capital under a variety of economic conditions. Such an impact study must take into account the uncertainty of the macroeconomic environment, since our work shows that by removing the assumption of perfect foresight the impact of CECL is the opposite to what was originally envisioned. In addition, because the current capital rules are calibrated based on the incurred loss methodology, regulators need to recalibrate the capital requirements under CECL. For banks subject to CCAR, that involves both recalibrating the stress capital buffer and the year-round capital requirements. For banks not subject to stress tests, it’s only the latter that matters. At a minimum, banking agencies should offset the impact of the change in the accounting standards on bank capital until the behavior of CECL reserves during an economic downturn is better understood. This blogpost summarizes some key results of a working paper just published by BPI that analyzes the performance of CECL had it been in place during the 2007-2009 financial crisis.